Citation Information: J Clin Invest. 2019. https://doi.org/10.1172/JCI123386. Soluble urokinase receptor (suPAR) is a circulatory molecule that activates αvβ3 integrin on podocytes, causes foot process effacement, and contributes to proteinuric kidney disease. While active integrin can be targeted by antibodies and small molecules, endogenous inhibitors haven’t been discovered yet. Here we report a novel, renoprotective role for inducible costimulator (ICOS) ligand (ICOSL) in early kidney disease through its selective binding to podocyte αvβ3 integrin. Contrary to ICOSL’s immune-regulatory role, ICOSL in non-hematopoietic cells limited the activation of αvβ3 integrin. Specifically, ICOSL contains arginine-glycine-aspartate (RGD) motif, which allowed for a high affinity and selective binding to αvβ3 and modulation of podocyte adhesion. This binding was largely inhibited either by a synthetic RGD peptide or by a disrupted RGD sequence in ICOSL. ICOSL binding favored the active αvβ3 rather than the inactive form and showed little affinity for other integrins. Consistent with the rapid induction of podocyte ICOSL by inflammatory stimuli, glomerular ICOSL expression was increased in biopsies of early stage human proteinuric kidney diseases. Icosl deficiency in mice resulted in an increased susceptibility to proteinuria that was rescued by recombinant ICOSL. Our work identified a novel role for ICOSL, which serves as an endogenous αvβ3-selective antagonist to maintain glomerular filtration. Soluble urokinase plasminogen activator receptor (suPAR) is an immune-derived circulating signaling molecule that has been implicated in chronic kidney disease such as focal segmental glomerulosclerosis (FSGS). Typically, native uPAR (isoform 1) translates to a three-domain protein capable of binding and activating integrins, yet the function of additional isoforms generated by alternative splicing is unknown. Here, we characterized mouse uPAR isoform 2 (msuPAR2), encoding domain I and nearly one-half of domain II, as a dimer in solution, as revealed by 3D electron microscopy structural analysis. In vivo, msuPAR2 transgenic mice exhibited signs of severe renal disease characteristic of FSGS with proteinuria, loss of kidney function and glomerulosclerosis. Sequencing of the glomerular RNAs from msuPAR2-Tg mice revealed differentially expressed gene signature that includes upregulation of the suPAR receptor Itgb3, encoding β3 integrin. Crossing msuPAR2-transgenic mice with three different integrin β3 deficiency models rescued msuPAR2-mediated kidney function. Further analyses indicated a central role for β3 integrin and c-Src in msuPAR2 signaling and in human FSGS kidney biopsies. Administration of Src inhibitors reduced proteinuria in msuPAR2-transgenic mice. 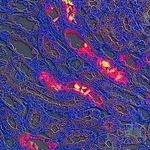 In conclusion, mouse uPAR isoform 2 may play an important role in certain forms of scarring kidney disease. Citation Information: J Clin Invest. 2019. https://doi.org/10.1172/JCI99296. Citation Information: J Clin Invest. 2018. https://doi.org/10.1172/JCI98595. In this episode, Alessia Fornoni reveals that TNF promotes free cholesterol–dependent podocyte apoptosis via an NFATc1/ ABCA1-dependent mechanism. Li Yang, Craig Brooks, and colleagues at Harvard Medical School demonstrate that KIM-1-mediated phagocytosis of apoptotic cells dampens inflammatory responses after kidney injury.. .